Paidvert$ is basically a Paid to Click (PTC) website. And much more: Its the next generation of PTC Systems! Read why and how to make a good profit with using this website. I started to use Paidvert$ a couple of weeks ago. After signing on, i “forgot” about the site until i found some time to take a deeper look at Paidvert$. And it simply rocks. Right now, the site earns me about 10 USD per day – with a potential of much more. Pro: No initial investment needed at all! Con: You will have to click ALOT of low value Ads! Pro: Much faster. When you invest about 20 USD, you will reach immediately the BAP Group “48.000 – 96.000″ which will give you Ads to click for an average value of about 2 USD/day. More about that later. I really suggest Method Two – Even a low invest like 5 USD will grant you a much faster start! Yeah. Its 20 USD Dollars for one click. I am currently at 1.200.000 BAP tho; thats a pretty high group at Paidvert$. BAP is a score. The higher your BAP score, the higher will be the value of the Ads you get to click! Ads unto 50 USD for ONE CLICK are possible. At the beginning there will be 8 BAP Ads per day. Thats 400 BAP per Day. Make sure to click them all – the more BAP, the better your Ad values will be. 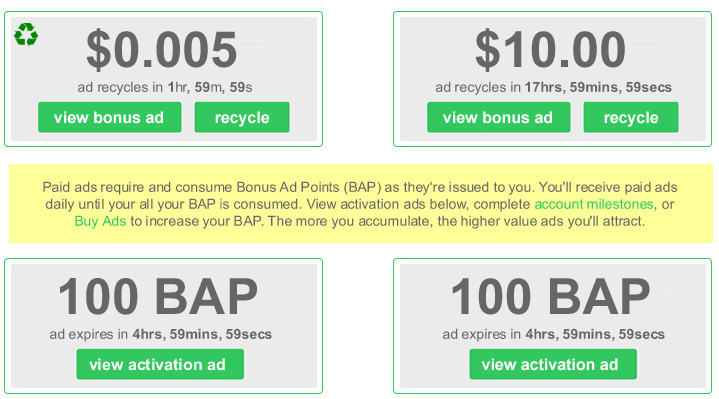 After clicking 100 BAP Ads, you will get only 2 BAP Ads per day. But at this point you should be already at a decent BAP Level. 1.) For each 1 Dollar you will spend, you will receive 3.100 BAP. Each BAP has a value of 0.0005 USD Dollars. Do the calculation: 3.100 x 0.0005 USD = 1.55 USD. Thats right. You will get BAP for 1.55 USD for every 1 USD you spend. And what does this mean? Simple: The BAP are used to deliver Ads to you. An easy example: You have 100.000 BAP and you get a 5 USD Ad delivered. 5 USD has a value of exactly 10.000 BAP. You will get the Ad, click it, get 5 USD on your PV balance and have a remaining score of 90.000 BAP (100.000 minus 10.000). What sense that makes? Simple: If you reinvest that 5 USD, you will get 5 x 3100 BAP for it. Thats 15.500 BAP and your score would raise to 105.500 BAP. Got it? The more you invest, the higher will your BAP go. The better will the Ads become and the more money you will earn. In the Highest BAP Group (10M and more) there will be a delivery of 700 USD in Ads per day! From every Ad money you get, withdraw about 30 percent and reinvest the rest! Example: You earn 20 USD per day. Thats reducing your BAP by 40.000 per day. 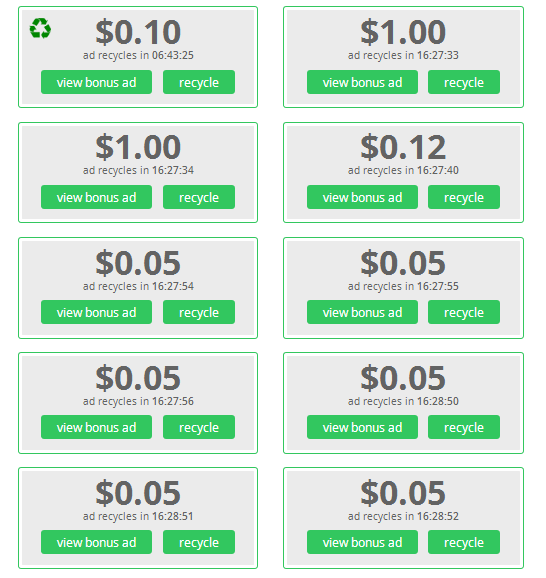 Withdraw about 6 USD by one of the supported methods (Paypal for example) and reinvest 14 USD by buying Ads on Paidvert$. 14 USD give you 43.400 BAP so you will not only stay in your BAP group, you will even raise slowly. And you will have a passive income of about 180 USD per month – just for doing some clicks! You afraid about what websites you should do Ads? No worries. This site will present in the next weeks a very valuable list: I will present you some websites, where you can create money. Some of them are without any investment (and take long), other require investments, but give you a fast way to get the money back!